This topic contains 1 reply, has 2 voices, and was last updated by Slam_Donck 3 months ago. I have been looking into the history of the Black community in Kingsbridge. What I found was very surprising to me–that Black people (both Africans and African Americans) composed a much larger portion of the population in the distant past than they do right now. This was surprising to me as I’ve read a lot of local history and this fact was never brought up to my knowledge. I will write an article about it eventually but I wanted to share two pages–one from the 1790 census and one from the 1850 census. 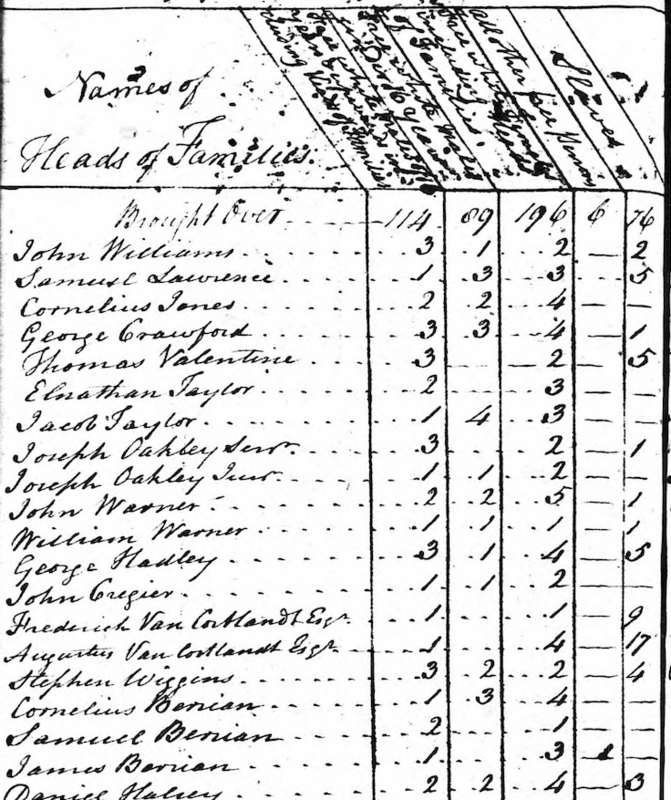 The 1790 census is for the township of Yonkers as Kingsbridge was part of Yonkers at that time. The first two columns are free white males. The third and fourth columns are free white females and “all other persons.” The last column is “Slaves.” The name in the second row is Samuel Lawrence, who lived just above the city line in today’s Yonkers. If you go down a few lines you encounter John Warner, William Warner, and George Hadley, who lived in today’s North Riverdale. If you keep going down, you see Augustus Van Cortlandt, who lived in the mansion in today’s park. What becomes clear is that the census taker is travelling down the Albany Post Road and stopping at all the houses from Yonkers to the Spuyten Duyvil Creek. The last entry in the below clipping is that of Daniel Halsey, who ran the tavern in Kingsbridge at today’s 230th and Broadway (where Dunkin Donuts is). The tavern would have fronted on the Spuyten Duyvil Creek at that time. When I first saw this I was blown away by the high numbers in the “Slaves” column. I just never figured slavery could have been so prevalent here. 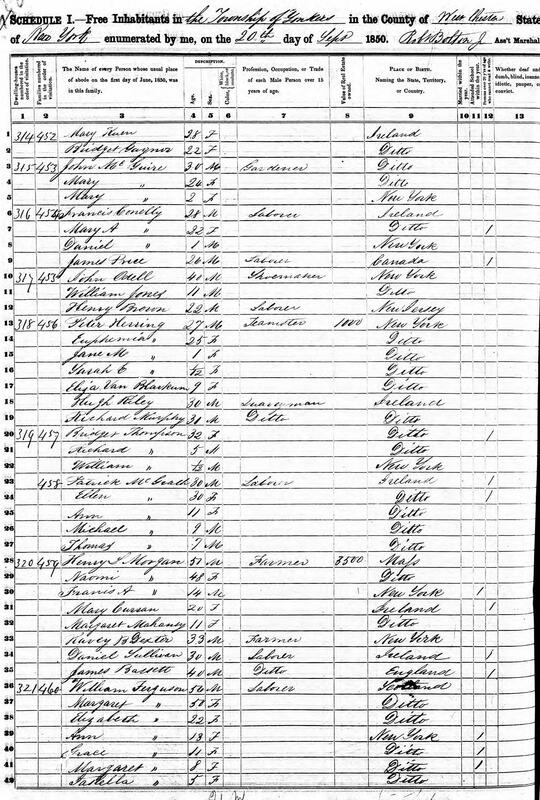 In light of the above, I found the below page from the 1850 census just as surprising. It shows a section from the same geographical area (I know this as Henry Morgan was living in today’s Van Cortlandt Park where he worked as a farmer and miller). In this section 18 of the 42 people listed are from Ireland. That is a very high portion of the neighborhood. Additionally, you see that the Black community nearly vanished (other pages of the census do show a very small number of Black people remained in Kingsbridge). It seems that after emancipation, they left en masse. I am thinking that the lack of affordable land and the attraction of New York City led the Black community to leave. There may have also been a desire to move away from the place of their enslavement. I am really not an expert in this period so I am just inferring, really. At the same time, the Irish were arriving to work–largely as “Laborers.” On this page, one of them is listed as a “Quarryman,” which I found interesting. The demographic history of the neighborhood is far more interesting that I ever thought. I wonder if the Irish were pushed to the outerboroughs because of their religion. THey didn’t like Catholics too much in Manhattan. And there are strong Irish enclaves today in the Bronx (Woodlawn Heights) and Queens (Rockaway).